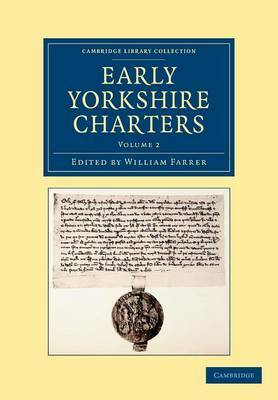 This thirteen-volume series, which first appeared between 1914 and 1965, is an extensive collection of the pre-thirteenth-century charters and related records of Yorkshire, which had previously remained largely unpublished. The first three volumes were edited by William Farrer (1861-1924), after whose death Charles Travis Clay (1885-1978) took up the task. The series was well respected for the quality of Farrer's editing, which was surpassed only by that of Clay in the later volumes. Volume 2 (1915) focuses on documents relating to Henry I, charting the redistribution of land in his move to establish his position as king. Each Latin text is prefaced with a summary in English, and documents of note are followed by a discussion of their content and points of interest, including genealogies of the people involved.